After settling in with a set of good vehicles, a heated home garage and a reliable mechanic nearby, I had forgotten just how badly many are served by the auto repair industry… until my young cousin stopped by with his little Audi turbo and asked me about oil changes. Ever the middle aged man willing to share knowledge, we stopped by the local auto parts store and got a bunch of Mobil 1 and Purolator PureOne oil filter, on special that week totaling less than $30. When we got under the vehicle, I got a shock. I wasn’t shocked by the silliness of being forced to drop an entire belly pan just to change the oil, I expect that level of bad design from auto companies nowadays. What bothered me is that half of the plastic rivets were missing, and those that remained were not well distributed. What was left flapped at high speeds and was rattled by bumps at all speeds. He was another victim of the Iffy Lube industry. Inexpensive auto rattle fighting tools. Daddy Long Legs optional. When finishing up I distributed the remaining rivets as best I could, and told him what he needed to get, which I’ll share here. There are several types, the important thing to realize is that if it’s not obvious and visible- such as the type that match your bumper cover color and hold the cover on- the type doesn’t matter. You can substitute the screw type, the push type, and the Christmas tree type with wild abandon, the only caveat being it has to be wide enough to hold in place. To that end there are several sizes, the most common being 6mm (aka 1/4″), 7mm, 8mm, and 10mm. Considering that a double handful only costs about $5, you might as well get yourself a selection. To that end, I’ll describe the advantages and disadvantages of each. The Christmas Tree type holds hardest and allows rattles the least, but is most difficult to remove. Use this for retaining fender liners and other soft covers that are not removed often. The screw type is strongest and next slowest to remove, but does not adjust to wear and tear. Use that for those things that love to rattle but do get serviced occasionally. Finally the expanding push-pin type is the fastest to remove and replace, use that for areas serviced often, such as those damnable oil change blocking belly pans. For extra protection from annoying rattles, get some clear silicone such as GE Silicone II and squeeze some around each rivet whole between the soft trim and the frame. 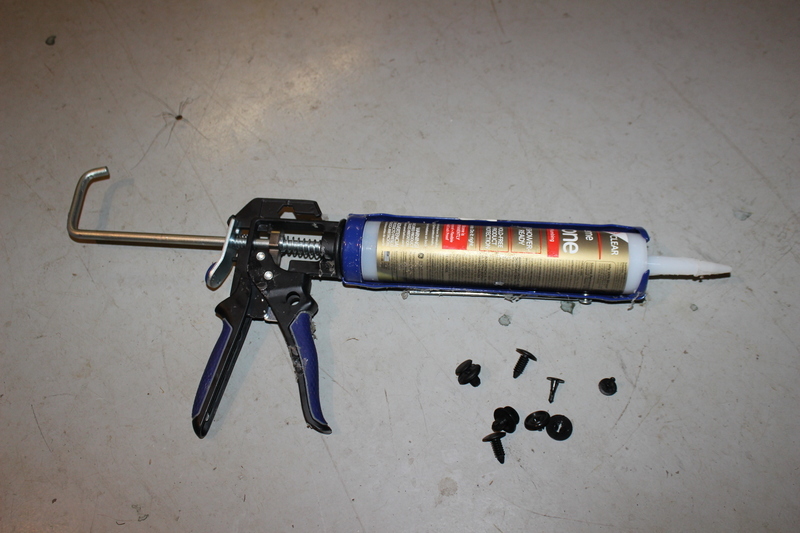 This is a very mild glue and can be undone simply by pulling hard on it. Really any clear Silicone will do fine, it is just not UV and Weatherproof as GE Silicone II. (One tip- always wear gloves and have paper towels handy when working with Silicone).